Today, LG unveiled its latest flagship phone, the G2. It’s distinguished by set of hardware and software innovations put it in a position to compete with the Android market leader, the Samsung Galaxy S4. On the hardware front, the G2 has a gorgeous 5.2-inch IPS display with an impressively thin 0.1 inch bezel, the smallest to date from any manufacturer. The LG G2 is just 2.7-inches wide—0.05 inches slimmer than the S4, while packing in a 0.2-inch bigger display. The panel also uses smaller sub-pixels than the S4 for crisper text. Another visible difference is the G2’s button placement. There’s a power button and a volume rocker and they’re both located on the back. So when I hold the phone, my index finger naturally sits on or next to the controls—even with my small hand. You don’t need to access the back controls, though, to turn the phone on. A new feature called KnockOn, lets you double tap the screen to wake your phone up. You can also answer calls without pressing a button with LG’s Answer Me feature. The gesture of putting the phone to your ear will answer the call. Simply lifting the phone to check who’s calling, won’t answer the call. So you can still dismiss with text or ignore a call with Answer Me turned on. Guest Mode, which gives guests (or kids) access to a set of applications that you predetermine, is another well thought out convenience feature. Guest Mode doesn’t show up as a separate profile, it’s just activated when you input a secondary pattern-based pin code. 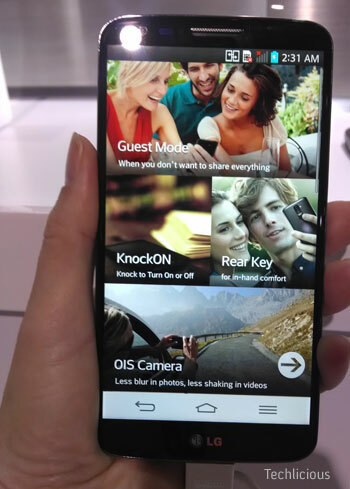 LG’s G2 sports a 13MP rear-facing camera with optical image stabilization (OIS). Other phones, like the Nokia Lumia 1020 also have OIS, but LG has managed to pack it into the body in a way that it doesn’t bulge out the back. In the demo, which was equivalent to a rocking boat, the G2 recorded the scene with minimal perceptible motion. OIS also means better low light capture, since the camera easily compensates for the camera shake that naturally occurs with longer exposures. And for those that like listening to music or watching movies, the G2’s support for 24 bit/192kHz Hi-Fi playback, a world’s first for smartphones, means richer sound. Granted you won’t hear much of a difference from its built-in speakers, but plug in a good set of headphones and you definitely will. LG pairs all of this functionality with a 2.26GHz Qualcomm Snapdragon 800 quad-core processor, 2GB of RAM and a 3000 mAh battery. All in, it’s a contender at the high end of the smartphone market. 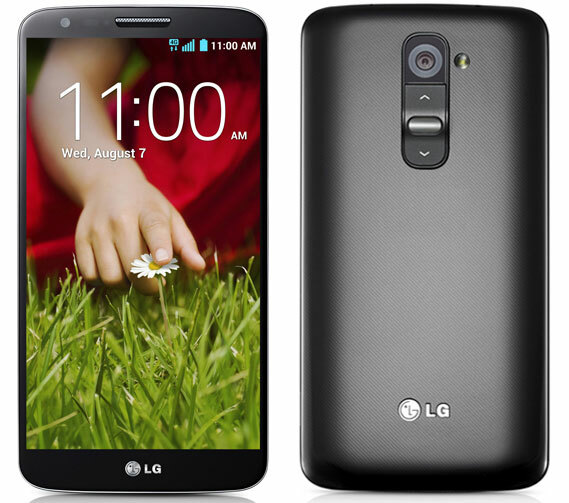 The LG G2 will available on all major carriers when it ships later this year. Pricing has not been announced.